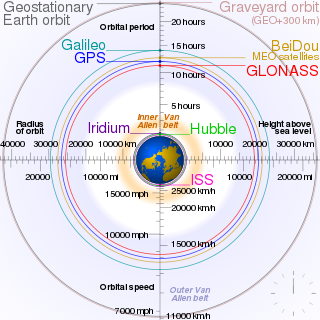 A geosynchronous orbit is an orbit around Earth of a satellite with an orbital period that matches Earth's rotation on its axis, which takes one sidereal day. The synchronization of rotation and orbital period means that, for an observer on Earth's surface, an object in geosynchronous orbit returns to exactly the same position in the sky after a period of one sidereal day. Over the course of a day, the object's position in the sky traces out a path, typically in a figure-8 form, whose precise characteristics depend on the orbit's inclination and eccentricity. Satellites are typically launched in an eastward direction. 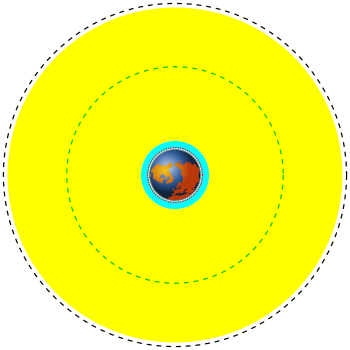 A circular geosynchronous orbit is 35,786 km (22,236 mi) above the Earth's surface. 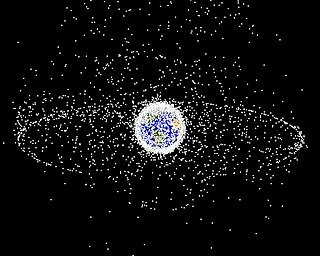 Those closer to Earth orbit faster than Earth rotates, so from Earth, they appear to move eastward while those that orbit beyond geosynchronous distances appear to move westward. An Earth observation satellite or Earth remote sensing satellite is satellite specifically designed for Earth observation from orbit, similar to spy satellites but intended for non-military uses such as environmental monitoring, meteorology, map making etc. The first occurrence of satellite remote sensing can be dated to the launch of the first artificial satellite, Sputnik 1, by the Soviet Union on October 4, 1957. 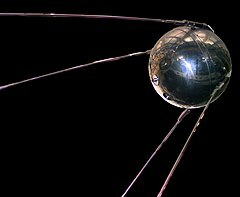 Sputnik 1 sent back radio signals, which scientists used to study the ionosphere. NASA launched the first American satellite, Explorer 1, in January 31, 1958. The information sent back from its radiation detector led to the discovery of the Earth's Van Allen radiation belts. The TIROS-1 spacecraft, launched on April 1, 1960 as part of NASA's TIROS Program, sent back the first television footage of weather patterns to be taken from space. As of 2008, more than 150 Earth observation satellites were in orbit, recording data with both passive and active sensors and acquiring more than 10 terabits of data daily. Medium Earth orbit (MEO), sometimes called intermediate circular orbit (ICO), is the region of space around Earth above low Earth orbit and below geosynchronous orbit. Space research is scientific study carried out in outer space, and by studying outer space. From the use of space technology to the observable universe, space research is a wide research field. Earth science, materials science, biology, medicine, and physics all apply to the space research environment. The term includes scientific payloads at any altitude from deep space to low Earth orbit, extended to include sounding rocket research in the upper atmosphere, and high-altitude balloons. Inmarsat-4A F4, also known as Alphasat and Inmarsat-XL, is a large geostationary communications I-4 satellite operated by UK based Inmarsat in partnership with the European Space Agency. Launched in 2013, it is used to provide mobile communications to Africa and parts of Europe and Asia.